Miss Kitty is a popular Aristocrat pokies game featuring 50 paylines and a very high paying bonus with sticky wilds. With similar game play to Pelican Pete, this is an exciting and innovative Australian pokies that you are almost guaranteed to find in most pokie venues. Symbols include Miss Kitty (WILD), Purple Moon (SCATTER), Mice, wool and milk scatters. 3 or more of the scattered Moon symbols trigger the free games feature with an exciting twist. During free spins whenever Miss Kitty lands on reels 2, 3, 4 or 5 she will become a sticky wild staying in position during the remaining free spins. Even better the free spins can re trigger and the wilds will stay in place. 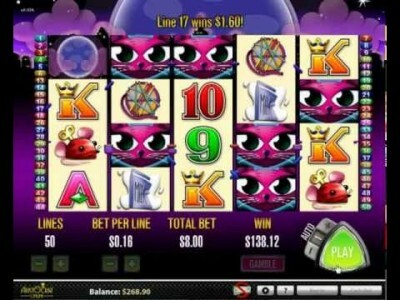 Miss Kitty also makes use of aristocrat pokies gamble function where you can double your winnings over and over again. Have a spin on our free Miss Kitty game and see for yourself what all the fuss is about.